Here are several restaurants in Las Vegas which give you bang for your buck. Some are great for breakfast or brunch, while others are best for lunch and most are good for a simple dinner. Keep in mind that these restaurants are off-the-strip and won’t be flashy, over-designed or expensive. What they will have is friendly service, a local following and good food. I’ve arranged them below in alphabetical order and not in order of preference. I had already written about Food Express in 2007 in a blog post on Restaurants off-the-strip but I thought I’d include it once again on my list as the place has undergone a slight renovation, not fancier but cleaner, and reopened recently after shutting down in early 2009 for several months. It used to be our go-to Chinese takeaway as it was so close to my sister’s house that we could order food, pick it up and get it home and it would still be piping hot. The food hasn’t changed and the menu is still varied with soups, starters, seafood and fresh from the tank fish, poultry, pork and beef, noodles and rice and even clay pot and sizzling plate dishes. We always order the same things but this time we had a Peking duck, served two ways: first with the skin rolled in pancakes (they usually serve them in steamed buns but we asked for it Beijing/Hong Kong style with pancakes that they also use for the moo-shu pork) and the second way with the duck meat shredded into fried rice. 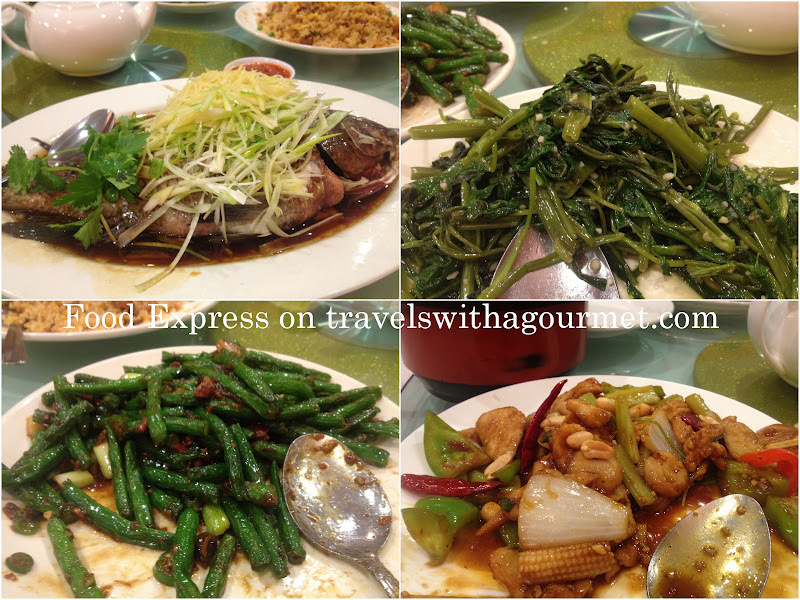 We also had a fresh whole flounder steamed with ginger and spring onion, two vegetables: spicy green beans with ground pork and the stir-fried ong choy (water spinach) with garlic, the spicy kung-pao chicken with dried chilies and peanuts, and creamy chicken and corn soup. Service was friendly, food came quickly and was very good and best of all, we spent about $15 per person (we were five adults and four kids under 11) and still had leftovers to take home. 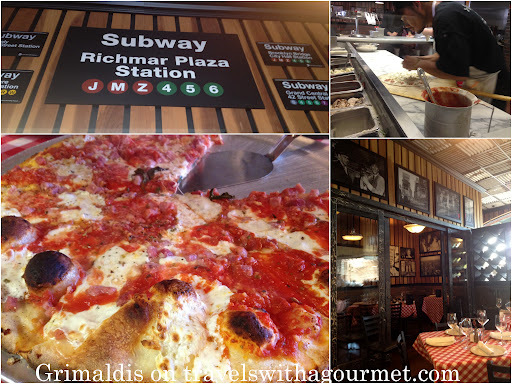 Founded in Brooklyn over a hundred years ago and well-known for its’ traditional NY-style thin-crust pizza makes Grimaldi’s good reputation. From the water they use for the dough, to the standard coal-brick ovens they use, Grimaldi’s has standardized and perfected pizza making to a fine art. It had been a while since I had a really good pizza so I was looking forward to our pizza lunch. The pizzas come in three sizes: personal, small and large and in three versions: classic tomato sauce and mozzarella, white (meaning no tomato sauce) with garlic, and a pesto version. We ordered three personal pizzas (as it’s the crispiest of the three crusts since it’s the smallest size) – a pizza margherita with just mozzarella and tomato sauce, another topped with pepperoni and a third white pizza and garlic topped with ham. Unfortunately, it wasn’t our day as the trainee waiter had bungled up our orders and given us three small-sized pizzas and also got our white pizza order wrong since he gave us a regular tomato sauce and mozzarella pizza with ham. The kids were hungry so we accepted the plain margherita and the pepperoni pizzas but we asked them to exchange the ham pizza to the original white pizza with ham we had ordered. The manager was kind enough to do all the changes and bring us a new white pizza while allowing us to take home the wrong pizza along with all the leftovers we had because of the wrong sizes. We chalked it up to a Friday the 13th lunch fiasco. Despite it all, the pizza was as promised – thin crust crispy and not overloaded and soggy with ingredients. Several days later, we ordered from the Grimaldi’s Summerlin branch which got our takeaway order right. We usually sneak in a Korean barbecue dinner when we’re in Vegas and we usually end up at our favorite, Korean Garden. This time around, we went to Honey Pig which was listed in Saveur magazine’s March issue as being the favorite of chef Rick Moonen. We were skeptical about a restaurant suggestion from a chef known for his fish but decided to give it a try anyway and good thing we did. 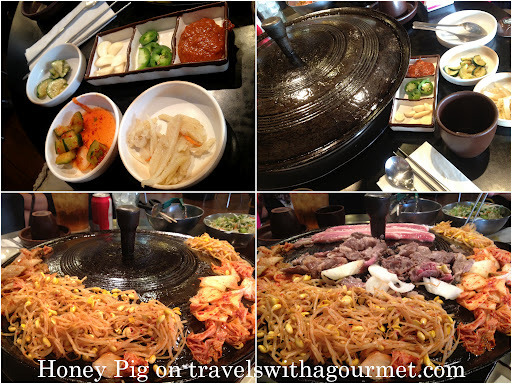 Honey Pig is a no-frills Korean barbecue joint with a round grill in the middle of the table where several types of thinly-sliced meat – beef and pork – are slammed on the grill surrounded by a mound of spicy bean sprouts and kimchi. We had beef short-ribs, beef bulgogi and paper-thin slices of pork belly sizzling on the super-hot grill one at a time along with several small dishes of traditional Korean banchan -pickled vegetables to accompany the different grilled meats. A great new discovery and fun for a family-style meal. Just be ready to smell smoked from head-to-toe afterwards. 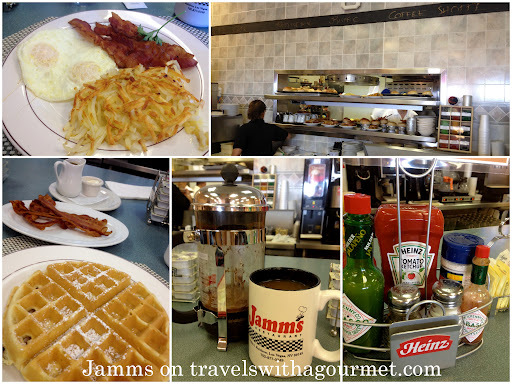 On every trip to Las Vegas over the years, I make my sisters take me to a “new” breakfast place – sometimes they’re actually brand-spanking new but usually, they’re just new because none of us have been there. This time around, that place was Jamms. We walked in on a not-so-busy Saturday morning just after the early breakfast rush and went straight to the counter for a quick meal. We each had a classic breakfast – sunny-side up eggs, hash browns and sausages for my sister and the waffle with a side of crispy bacon for me. Amazingly, their coffee is fresh-brewed illy (a first for this type of diner restaurant) or French-press illy which already puts this in my good books. Service is quick and efficient and tables turn quickly so get ready to eat and go, even if they don’t rush you, as you will see the line snaking out the door. On another morning, we went back and I had the bacon and eggs with crispy hash browns while my sister had the buttermilk pancakes. Breakfast is as you expect and the portions are good but not over-the-top. Their specialty is fresh-baked pot of bread which comes either plain (sort of like a brioche) or in the daily fruit flavor like cinnamon raisin or peach. They also have sandwiches, salads, paninis and burgers for the lunch crowd but breakfast is served all-day long so it’s perfect for brunch as well. Lotus of Siam isn’t a new addition but an old favorite as it was listed as the best Thai restaurant in the U.S. I’ve been several times but thought I’d include it anyway since it’s a great place for lunch. They have a daily lunch buffet which is a bargain and a good way to sample Thai food if it;s your first time. I prefer the a la carte lunch as I get to have my favorites all in one meal: mee krob (sweet and spicy crispy fried noodles with prawns), something in red curry – duck or beef, Thai fried rice and the crispy deep-fried garlic prawns. 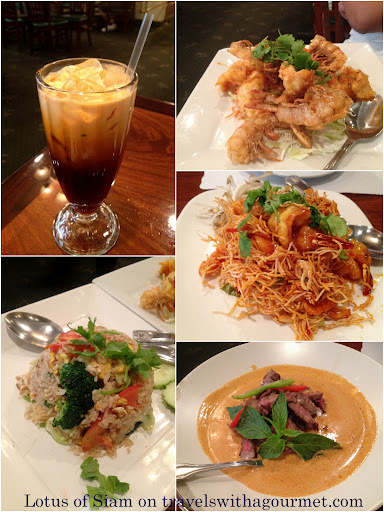 They also have fantastic Northern-Thai specialty dishes and Thai-style barbecued meats. There’s something for everyone at Lotus of Siam and the good thing is if you want to veer away from the typical Pad Thai then you’ll be spoilt for choice plus I love to go there for lunch when it’s less crowded, service is not rushed and the lunch specials are a bargain. 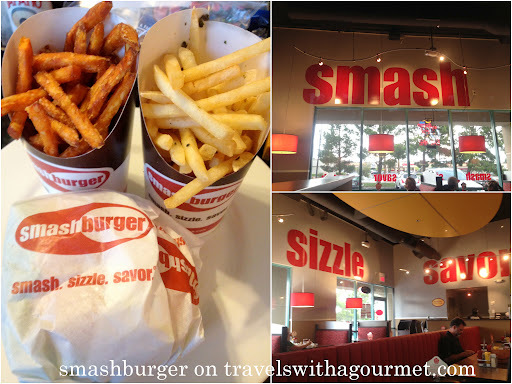 Last but not least in my off-the-strip list is smashburger with its’ compact menu of fun burgers in two sizes – smash and big smash. You can create your own burger and choose everything from the bread (classic egg, multi-grain or spicy chipotle) or just a lettuce for those Atkins dieters to the cheese (American, aged Swiss, blue, goat, pepper jack and sharp Cheddar) and to a whole load of sauces and toppings. Alternatively, you can order one of their specialty burgers (they even have veggie black-bean burgers). In Las Vegas, they have the Sin City burger with a fried egg, applewood smoked bacon, American cheese, grilled onions, haystack onions and their signature smash sauce on an egg bun. They also have all-white meat grilled or crispy chicken sandwiches, salad and an assortment of sides: french fries (classic shoestrings), smash fries (shoestrings tossed in rosemary, olive oil and garlic), sweet potato fries, sweet potato smash fries and chili cheese fries. Shakes are made using Haagen-Dazs ice cream and there are also bottled soda floats and malts made to order. *Open for buffet and a la carte lunch Mondays to Fridays from 11:30 a.m. to 2:00 p.m.
*Open for a la carte dinner on Mondays to Thursdays from 5:30 p.m. to 9:30 p.m. and on Fridays to Sundays from 5:30 p.m. to 10:00 p.m.